Another non-human character joins our cast, this time a Dwarf! Dwarves are typically lonely, cranky, calculating fellows in the Riven Realms. Their homeland was utterly decimated in the Calamity and has remained uninhabitable ever since. All the magnificent achievements, inventions, and treasures of the mighty Dwarven kingdom went up in flames when it was engulfed in a volcanic cataclysm. And because the volcanoes are still very much active, there is little hope of reclaiming anything from the ruins. Most Dwarves were killed during the Calamity and today, only several thousand remain. For all intents and purposes, they are a dead race. Vagrus - The Riven Realms is a game rich in storylines and quests, and most of these appear in the form of what we call Events: text based interactions where your choices guide the story. There are a lot (and I mean a LOT) of these Events and due to their nature, writing for the game involves quite complex scripting and a non-linear narrative design angle. But what does this mean in practice and what does it involve? 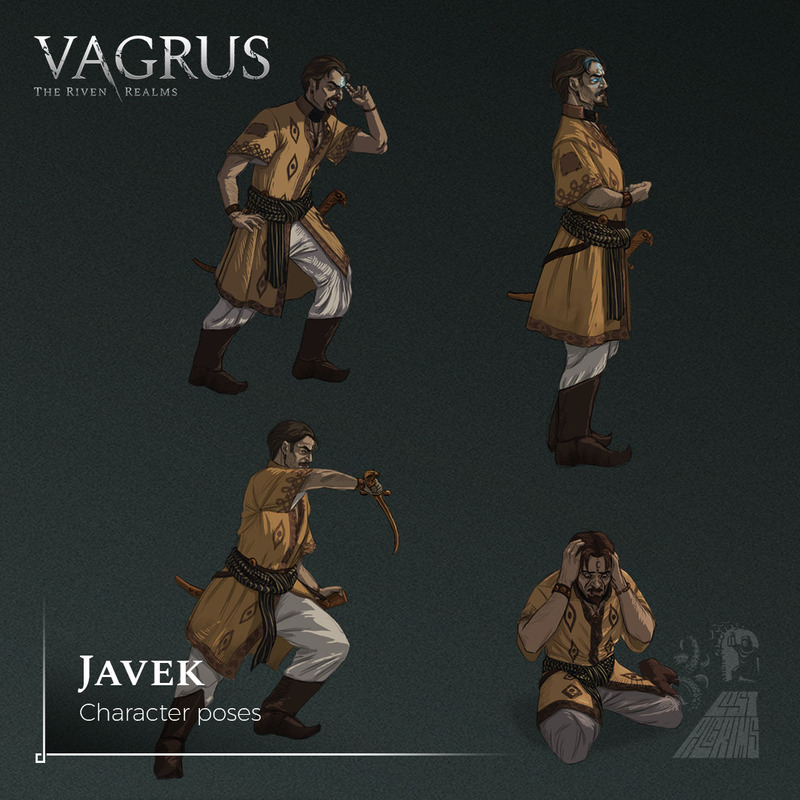 Javek is one of our main characters in the Prologue and he'll hopefully make his return in the main game, too. A budding sorcerer with telepathic powers, he can read thoughts, see glimpses of the future, and even cause pain and damage to someone's mind. Here are some character poses for the Orc Marauder enemy to feast your eyes upon! Cheap Shot (top left): A melee hit that puts a severe debuff on the target. Also, ouch. Dodge (top right): Triggers when the Bruiser avoids an attack. Bull Rush (bottom left): The Bruiser rushes the target and pushes it back. Smack (bottom right): A melee attack against a single target. The Bruiser is a basic frontline character in the outlaw roster. Though not armored or particularly good at avoiding damage, he is fairly tanky and is able to dish out a lot of pain as well as debuffs and other effects. It can be extremely effective in cooperation with the Brigand and the Slinger. It's time to share some combat images for the character 'Slinger' (more on him here: https://vagrus.com/news/character-artwork-slinger ). Here's another little character art post. This time, there are four combat poses/phases for the Priest of Sergorod.